Want to be able to write a great blog post quicker and easier? If you find yourself spending far too long writing an article that should only take an hour or 2 then stick around. By the end of this article, you'll know how to craft a great 1000 word article in around 90mins or less. How to write a 1000 word article in under 90 minutes. Before you get started you need to make sure you can work with super focus. Something I that I find super helpful and which increases productivity is using something called the Pomodoro technique. The Pomodoro technique is essentially working in 25-minute blocks with five minutes rest, every 4th Pomodoro round you then take a longer 15-25 minute break. When you work in 25-minute chunks it's much easier to stay focused. The 5-minute break gives you time to relax and refocus, ready to go again for another 25 minutes. It's my secret weapon for powerful productivity. 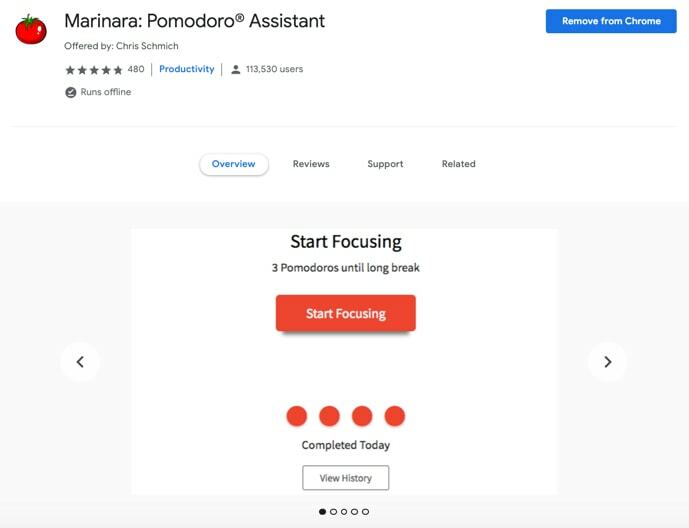 If you use the Pomodoro Chrome Extension you'll stay focused and get much more done. You can download the Chrome extension for free here and use it when you work. Trust me you'll be happy you did. If you're not using the Google browser, then use a timer on your phone and work in 25 min blocks with 5 mins rest. 2. Create the headers first. The first thing you want to do when you're creating a piece of content is quickly jot down all the main points of the article. For example, in this article, I wrote down all the headers before I wrote this post. I had a quick think of all the steps involved in writing a 1000 word blog post in under 90 minutes. Once I had done that I got ready to write the first draft of the article. 3. On the first draft never backspace. Not even once. You must never backspace, not even once. No backspacing in the first draft is the most essential part of being able to write a post quickly. Your first draft WILL look like crap. There will be tons of spelling mistakes and grammar errors and half started sentences which you decided to start again. But don't worry you'll go back and edit it after the first draft. What this does is allow you to write without stopping and starting which will keep you in your flow. When you keep stopping to correct spellings and grammar plus restarting sentences you will lose your focus. Just write uninterrupted with no backspacing whatsoever. Not going back to edit will feel very unnatural but you will be amazed at how fast you can write the first draft. 4. Go back and edit with Grammarly. After you've written your first draft you can now go back and edit your article for spelling and grammar mistakes. You may also have a few half started sentences you want to delete. This is totally normal and part of the process. I highly recommend you use Grammarly to do this. My first draft had tons of spelling and grammar mistakes which Grammarly showed me. Here's some of what my article looked like before I edited with Grammarly. Told you it looks terrible before editing 😬. Grammarly also shows what the possible changes are supposed to be. The whole editing process is sped up because I use Grammarly. Click here to get Grammarly for free. The free plan you get critical grammar and spelling checks. I personally use the pro plan myself now as it has advanced checks for punctuation, grammar, context, and sentence structure. Plus it checks for plagiarism. The amount of spelling and grammar mistakes I make in the first draft is so much that I choose to use the pro version as it helps me more. You might not be as bad as me though. Free or paid it's up to you but they are both fantastic. I just speed type the first draft with no backspacing and let out all my thoughts, then after I take ten minutes with Grammarly to fix all the problems. 5. Add images after the first draft. Next, I would add the images to the post where necessary. If you have sections with significant amounts of text, then those are good areas to add an image to break up the text. Also if you've got something you want to highlight with examples then add those images where appropriate. Only add the images after you've done your first draft and editing with Grammarly. Otherwise, it will stop your flow which will slow down the time it takes to write your article. Once you've added your images it's time for the last bit. 6. One last skim over. Even though you've made your edits with Grammarly you may notice words that you didn't pick up. Even though Grammarly is fantastic it still may miss a word that's spelled correctly but used incorrectly. For example, you may have written super healthful instead of super helpful and it may not have got picked up. Grammarly does pick up most of the words that may be used incorrectly, but to make sure it's worth checking manually after. Those are the small things you need to check for quickly. It's shouldn't take more than a couple of minutes. This shouldn't take you long either as you've got the main draft completed and all the spelling and grammar is correct. It's much easier to see what you need to add or take away once you've done that first draft. Congratulations! You've just pumped out a great article in record time. It's amazing how quickly you can write an article if you don't press backspace. If you use this method then I guarantee you will be writing articles at least twice as fast as you would normally write them, if not more. Here's a quick summary of the points from this article. 2. Create the headings first. 3. On the first draft never backspace, not even once. 6. One last skim over to make any final changes. Good luck and please comment below and let me know how quick you wrote your article in comparison to your normal time. If you would like to create your own money making blog then check out this post on how to set up a blog in 15 minutes or less.